Source of Support: None, Conflict of Interest: None of the authors have any confl ict of interest with the results of this study, fi nancial or otherwise. Study drugs were donated by M/s Tablets India, Chennai. The company had no role either in the design and conduct of the study or in the analysis of results and preparation of this paper. Objectives: To assess the efficacy and safety of NSF-3, a polyherbal sedative-hypnotic (containing standardized extracts of Valeriana officinalis, Passiflora incarnate and Humulus lupulus), in comparison to zolpidem in primary insomnia. Materials and Methods: The present study was designed as a parallel group, double- blind, randomized, controlled trial and registered with Clinical Trials Registry-India (CTRI/2011/12/002197). Patients diagnosed with primary insomnia with a perceived total sleep time of <6 hours per night and insomnia severity index >7 were included. They were treated with either NSF-3 (one tablet) or zolpidem (one 10 mg tablet) at bedtime for two weeks. Total sleep time, sleep latency and number of awakenings per night were assessed using a sleep diary. Quality of life and daytime sleepiness were evaluated by insomnia severity index and Epworth sleepiness score respectively. Vital signs, routine blood counts, liver and renal function tests, and treatment emergent adverse events were recorded for safety assessment. Results: A total of 91 subjects were recruited, of which 39 in each group completed the study. There was significant improvement in total sleep time, sleep latency, number of nightly awakenings and insomnia severity index scores in both groups. However, no statistically significant difference was observed between the groups. Epworth sleepiness scores did not change significantly over the study period. 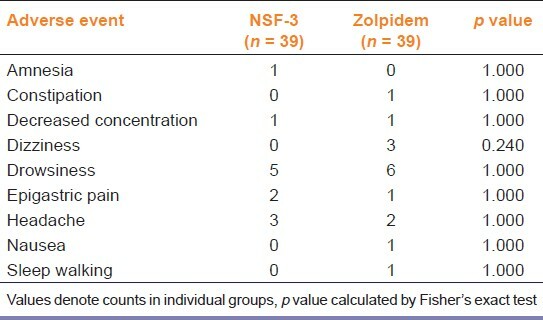 Although 12 treatment emergent adverse events were reported with NSF-3 and 16 with zolpidem (commonest was drowsiness in both), most were mild and no serious adverse events were encountered. Conclusions: NSF-3 is a safe and effective short-term alternative to zolpidem for primary insomnia. It remains to be explored whether the benefits are sustained and whether there is dependence liability with this formulation upon long term use. Plant derived drugs have been used since antiquityfor the treatment of insomnia. Many of them are available as over-the-counter (OTC) preparations in various countries. Their efficacy has been reported in animal studies and studies are also being done to establish the effectiveness of these herbal remedies in humans. However, the majority of human trials seek to establish efficacy of a plant drug in comparison to placebo. Studies comparing the efficacy of herbal preparations with modern allopathic medicines are lacking. In the present study, we sought to compare the efficacy and safety of NSF-3, a proprietary oral herbal formulation, recently marketed in India, with zolpidem, a benzodiazepine-like modern sedative-hypnotic drug, through a randomized controlled trial. The study was designed as a prospective, parallel group, double-blind, randomized controlled trial. It has been retrospectively registered with Clinical Trials Registry India (CTRI/2011/12/002197). The study commenced after obtaining approval from the Institutional Ethics Committee. Between June 2010 to May 2011, adult patients of either gender, attending the outpatient clinic of General Medicine of a teaching hospital, with sleep problems, were screened. Those diagnosed with primary insomnia according to DSM IV criteria,  an average night sleep time of <6 hours and insomnia severity index <7 were enrolled in the study. A written informed consent was obtained prior to inclusion in the study. Careful clinical history and examination were undertaken to exclude patients with psychiatric illnesses, major organ disease, or on concomitant drugs that affect sleep. History was also taken from accompanying family members, especially to rule out psychiatric comorbidity. Patients with known dependence on any sedative-hypnotic drugs, history of smoking or substance abuse, use of tobacco or caffeinated beverages during nighttime awakenings and night shift workers were also excluded. The test drug NSF-3 was supplied, on request, by the manufacturer M/s Tablets India, Chennai. Each NSF-3 tablet contains 410 mg of polyherbal extract in the form of 300 mg valerian extract (standardized to 0.8% total valerinic acid), 80 mg passion flower extract (4% isovitexin) and 30 mg hops extract (0.35% rutin). All three ingredients belong to the United States Food and Drug Administration (FDA) 'generally regarded as safe' (GRAS) category. Zolpidem was purchased from a pharmaceutical distributor as SOBRIUM tablet (each containing 10 mg) which is marketed by M/s Ranbaxy Laboratories, Gurgaon. Both test and comparator drugs procured were from a single batch (NSF-3 Batch No. 9RDT 001 manufactured Nov, 2009, expiry Oct, 2011; SOBRIUM Batch No. 9002918, manufactured Dec, 2009, expiry Nov, 2011). To ensure double-blinding, the tablets were removed from their original packs and repackaged into opaque, airtight, screw-cap, medicine grade plastic containers labelled with the appropriate protocol identifier, medication code and date of expiry. The investigator who actually attended to the patients was not involved in this repackaging exercise. Patients were advised to take one tablet daily at bedtime, store the medicine containers in a cool dry place away from direct sunlight and to ensure that the screw cap was tightly refitted after use. Subjects were randomized in blocks of 20 in 1:1 ratio using WinPepi (version 10.1, 2010) software. There was no stratification. The master randomization list was retained by one senior investigator while the randomization code was provided to the observing investigator, sequentially on recruitment, in serially numbered, opaque, sealed envelopes. The code was broken only after completion of data entry and database locking. Each subject underwent 4 study visits, namely screening, baseline, 7-day follow-up and end-of-study visits. At screening, subjects enrolled were given a sleep diary in their native language and instructed carefully to fill in the time to go to bed, approximate time of falling asleep, time at which he/she woke up next morning and also total number of night time awakenings. Average sleep latency, total night sleep duration and number of nightly awakenings, for 1 week prior to the visit, were estimated on the basis of this sleep diary. Each patientwas treated for 2 weeks. The insomnia severity index  and Epworth sleepiness scale score  were calculated at baseline, follow-up and end-of-study visits to assess quality of life and daytime sleepiness respectively. The sleep diary was scanned at each of these visits to record the efficacy parameters. Safety was evaluated at each visit by taking thorough history and conducting clinical examination. Complaints of the patient as well as adverse events noted by the investigators were noted as treatment emergent adverse events. In addition routine blood counts and tests of hepatorenal function were done at baseline and at study end. Compliance with study medication was assessed through the pill count method at the 7 day follow up and end of study. For the purpose of sample size calculation, average total night time sleep duration over past 7 days was taken as the primary outcome measure. It was calculated that 37 subjects would be required per group, in order to detect a difference of 1 hour in night time sleep duration between groups, with 80% power and 5% probability of type 1 error. This calculation assumed a standard deviation of 1.5 hours for night time sleep duration. Anticipating 20% dropout rate, the recruitment target was set at 46 subjects per group, or 92 subjects overall. Data have been summarized by routine descriptive statistics. Numerical variables have been compared between groups by Student's t test, if normally distributed, or by Mann-Whitney U test, if otherwise. Repeated measures ANOVA or Friedman's ANOVA have been used to compare change in numerical variables over time within a group. Fisher's exact test or Pearson's Chi-square test have been employed for intergroup comparison of categorical variables. All analyses were 2-tailed and p < 0.05 was considered to be statistically significant. Graph Pad Prism version 5.0 San Diego, California: Graph Pad Software Inc., 2007 and Statistica version 6 Tulsa, Oklahoma: StatSoft Inc., 2001 software were used for statistical analysis. A total of 134 patients were screened of which 91 were randomized into two groups, and 39 in each group completed the study. [Figure 1] depicts the flow of study participants. As seen from [Table 1], demography and baseline characteristics were comparable in the two groups. The changes in outcome parameters are depicted in [Table 2] and [Table 3]. Change in the average night sleep duration after two weeks of treatment was significant in both the groups. However, no statistically significant difference between groups was observed. Similarly, sleep latency decreased individually in both arms without intergroup difference. The quality of life impairment was evaluated using Insomnia Severity Index, which also showed statistically significant decline individually in the two groups without intergroup difference, either at baseline or at study end. At the end of the study, more than 50% of the subjects had no insomnia (total night sleep duration >6 hours) in both the groups. 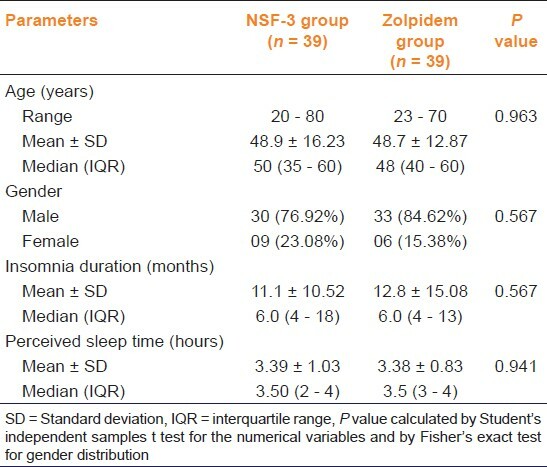 However, a proportion (6/39 patients in NSF-3 group and 10/39 patients in zolpidem group) still had significant insomnia with a total night sleep duration <4 hours and/ or sleep latency >30 minutes. These results do not differ significantly between groups. [Table 4] depicts the Epworth Sleepiness scale scores as a measure of day time sleepiness. There was no difference between groups for sleepiness scores at baseline, follow-up or study end. Also there was no statistically significant change in score within groups. [Table 5] depicts the various treatment emergent adverse events observed in the study population. Most were mild to moderate in severity. Physical examination revealed no significant abnormalities in any patient as compared to baseline. Comparison of body weight, heart rate and blood pressure showed no differences.None of the laboratory parameters changed significantly from baseline in either group. No serious adverse events were encountered. The compliance levels were defined a priori as excellent, good or fair if not more than 2, 4 and 6 of scheduled doses are missed respectively. Poor compliance level was defined as any situation worse than fair. 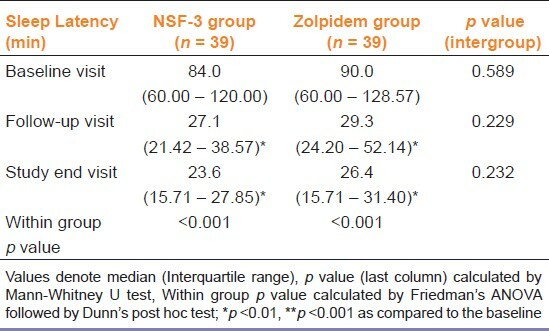 Excellent compliance was shown by 26 (66.67%) subjects on NSF-3 and 34 (87.18%) subjects on zolpidem. Rest of the subjects all showed good compliance. There were no complaints regarding organoleptic tolerability of either preparation. This is the first randomized controlled study to compare a polyherbal sedative, containing extracts of the three plants as stated above, with the modern sedative-hypnotic zolpidem. The results suggest that the effectiveness of NSF-3 in alleviating sleep related problems is comparable to zolpidem, while causing minimal adverse effects. Lack of significant daytime sleepiness can be an added advantage since many of the currently used sedative-hypnotics cause day time daytime drowsiness that may impair quality of life and have other undesirable sequels in chronic insomnia. However, a proportion of non-responders is to be expected. Unlike most modern medicines where a single known chemical is responsible for all the action of the drug, herbal drugs contain myriad chemicals. With advancement of analytical techniques, most constituents of these mixtures can be identified but it is difficult to single out the individual constituents responsible for the pharmacological activity. The concentrations of these constituents may also vary greatly with the method of cultivation, geographical location and season in which the plant raw material is collected. To add to this complexity, conditions under which active ingredients are isolated may themselves differ. Hence it is essential to use well standardized formulations in clinical trials, which we were able to do. Though few clinical studies have been done with the combination of these three herbal drugs, several studies have been done to test efficacy and safety of individual components. A meta-analysis of studies comparing subjective assessment of sleep induced by valerian as compared to placebo showed significant superiority over placebo, though the same meta-analysis showed no significant difference in reducing sleep latency as compared to placebo  while others show significant improvement of sleep duration and sleep latency with valerian over placebo. Most of the studies done on valerian demonstrate its safety. ,,, A study done with a fixed dose combination of hops and valerian (Ze 91019) compared to oxazepam showed no difference between groups but significant improvement in sleep latency within groups. Few animal and human studies also show beneficial effects of passion flower in treatment of insomnia and generalized anxiety disorder,  though there is inadequate data to clearly establish efficacy. The study had some limitations. Ideally, in a double blind study both formulations should be identical in shape, size, texture, taste and other physical attributes. In our case, the two formulations were similar but not exactly identical. Sleep evaluation was based only on sleep diary, although polysomnography can give more accurate results. Owing to the relatively short treatment period, long-term adverse events of the polyherbal formulation, abuse potential and possible withdrawal symptoms upon discontinuation were not evaluated. Also all patients with major co-morbidities, psychiatric or otherwise, were excluded from the study, although such patients comprise a large proportion of the patient load in insomnia clinics. This limits the generalization of the study findings. Notwithstanding these limitations, we can conclude that this polyherbal formulation is an acceptable alternative to zolpidem in the short-term treatment of primary insomnia. In view of the huge costs that untreated insomnia imposes on healthcare systems,  sincere efforts need to be made to look for safe and effective herbal remedies for its treatment. Larger studies with polysomnographic evaluation are needed to decisively evaluate effectiveness and safety of this polyherbal combination in primary insomnia as well as secondary forms of sleep disorders. Finally, the long-term effects in chronic insomnia also merits study in the light of the promising short-term results. We would like to acknowledge Dr. M. Kumaravel, Senior Medical Advisor, M/s Tablets India, Chennai, for arranging supply of the test drug (NSF-3) free of cost. Prof. Sasanka Chakraborty, Head, Department of Biochemistry, IPGME&R, Kolkata and Dr. Somyabrata Munshi, resident in the same department, deserve our gratitude for facilitating the biochemical tests required in this study. 1. Doghramji K. The epidemiology and diagnosis of insomnia. Am J Manag Care 2006;12:S214-20. 2. Pigeon WR. Diagnosis, prevalence, pathways, consequences and treatment of insomnia. Indian J Med Res 2010;131:321-32. 3. Szentkirályi A, Madarász CZ, Novák M. Sleep disorders: Impact on daytime functioning and quality of life. ExpertRev Pharmacoecon Outcomes Res 2009;9:49-64. 4. Gooneratne N. Complementary and alternative medicine for sleep disturbances in older adults. Clin Geriatr Med 2008;24:121-38. 5. Approved fixed combinations. In: Blumenthal M, editor. The complete German Commission E monographs. Therapeutic guide to herbal medicine. Austin, Texas: American Botanical Council Austin;1998. p. 245-306. 6. Coleta M, Batista MT, Campos MG, Carvalho R, Cotrim MD, Lima TC, et al. Neuropharmacological evaluation of the putative anxiolytic effects of Passiflora edulis Sims, its sub-fractions and flavonoid constituents. Phytother Res 2006;20:1067-73. 7. Ichimura T, Yamanaka A, Ichiba T, Toyokawa T, Kamada Y, Tamamura T, et al. Antihypersensitive effect of an extract of Passiflora edulis Rind in spontaneously hypersensitive rat. Biosci Biotechnol Biochem 2006;70:718-21. 8. Ngan A, Conduit R. A double-blind, placebo-controlled investigation of the effects of Passiflora incarnata (passion flower) herbal tea on subjective sleep quality. Phytother Res 2011;25:1153-9. 9. Dhawan K, Dhawan S, Sharma A. Passiflora: A review update. J Ethnopharmacol 2004;94:1-23. 10. Zanoli P, Zavatti M. Pharmacognostic and pharmacological profile of Humulus lupulus L. J Ethnopharmacol 2008;116:383-96. 11. Lee YJ. Overview of the therapeutic management of insomnia with zolpidem. CNS Drugs 2004;18:17-23. 12. 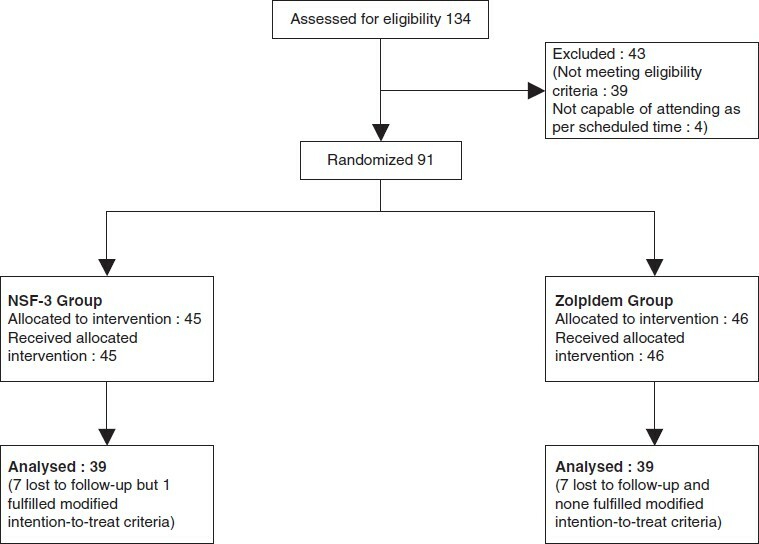 Victorri-Vigneau C, Dailly E, Veyrac G, Jolliet P. Evidence of zolpidem abuse and dependence: Results of the French Centre for Evaluation and Information on Pharmacodependence (CEIP) network survey. Br J Clin Pharmacol 2007;64:198-209. 13. American Psychiatric Association. Diagnostic and statistical manual of mental disorders (DSM IV). Washington, DC: American Psychiatric Association;1994. 14. Bastien CH, Vallieres A, Morin CM. Validation of the Insomnia Severity Index as an outcome measure for insomnia research. Sleep Med 2001;2:297-307. 15. Johns MW. A new method for measuring daytime sleepiness: The Epworth sleepiness scale. Sleep 1991;14:540-5. 16. Wähling C, Wegener T, Tschaikin M. Triple herbal combination: An effective alternative to benzodiazepines. Z Phytother 2009;30:69-72. 17. Staiger C, Wegener T. Three plant combination for treating sleep disorders and restlessness. Z Phytother 2006;27:12-5. 18. Fernández-San-Martín MI, Masa-Font R, Palacios-Soler L, Sancho-Gómez P, Calbó-Caldentey C, Flores-Mateo G. Effectiveness of Valerian on insomnia: A meta-analysis of randomized placebo-controlled trials. Sleep Med 2010;11:505-11. 19. Dimpfel W, Suter A. Sleep improving effects of a single dose administration of a valerian/hops fluid extract - a double blind, randomized, placebo-controlled sleep-EEG study in a parallel design using electrohypnograms. Eur J Med Res 2008;13:200-4. 20. Taibi DM, Landis CA, Petry H, Vitiello MV.A systematic review of valerian as a sleep aid: Safe but not effective. Sleep Med Rev 2007;11:209-30. 21. Bent S, Padula A, Moore D, Patterson M, Mehling W. Valerian for sleep: Asystematic review and meta-analysis. Am J Med 2006;119:1005-12. 22. Stevinson C, Ernst E. Valerian for insomnia: Asystematic review of randomized clinical trials. Sleep Med 2000;1:91-9. 23. Koetter U, Schrader E, Käufeler R, Brattström A. A randomized, double blind, placebo-controlled, prospective clinical study to demonstrate clinical efficacy of a fixed valerian-hops extract combination (Ze 91019) in patients suffering from non-organic sleep disorder. Phytother Res 2007;21:847-51. 24. Akhondzadeh S, Naghavi HR, Vazirian M, Shayeganpour A, Rashidi H, Khani M. Passion flower in the treatment of generalized anxiety: A pilot double-blind randomized controlled trial with oxazepam. J Clin Pharm Ther 2001;26:363-7. 25. Trauner G, Khom S, Baburin I, Benedek B, Hering S, Kopp B. Modulation of GABA A receptors by valerian extracts is related to the content of valerinic acid. Planta Med 2008;74:19-24. 26. Schellenberg R, Sauer S, Abouraashed EA, Koetter U, Brattstrom A. The fixed dose combination of valerian and hops (Ze 91019) acts via a central adenosine mechanism. Planta Med 2004;70:594-7. 27. Dietz BM, Mahady GB, Pauli GF, Farnsworth NR. Valerian extracts and valerinic acid are partial agonist of the 5-HT 5a receptor in vitro. Brain Res Mol Brain Res 2005;138:191-7. 28. Nassiri-Asl M, Zamansoltani F, Shariati-Rad S. Possible role of GABA A - benzodiazepine receptor in anticonvulsant effects of Pasipay in rats. Zhong Xi Yi Jie He XueBao 2008;6:1170-3. 29. Butterweck V, Brattstroem A, Grundman O, Koetter U. Hypothermic effects of melatonin receptor are antagonised with the comparative melatonin receptor antagonist luzindole in mice. J Pharm Pharmacol 2007;59:549-52. 30. Rosekind MR, Gregory KB. Insomnia risks and costs: Health, safety, and quality of life. Am J Manag Care 2010;16:617-2.